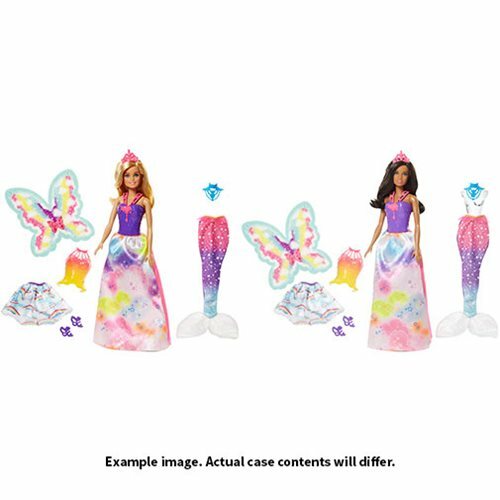 Travel through all of Rainbow Cove with this Barbie Dreamtopia Dress-Up Giftset Case! Each pack comes with Barbie doll and different fantasy outfits. Transform the doll's look in an instant with a change in clothing or accessory. The pieces are inspired by the color-filled land with lots of bright colors, clouds, and stars. Each Barbie doll set has two colorful snap-on bodices, a princess skirt and matching pair of shoes, a rainbow-print fairy skirt and a pair of fairy shoes, a mermaid tail, a necklace, a tiara and a pair of wings adorned with butterfly inspiration and bright colors. Simply slide the tail over Barbie doll's legs to dive into mermaid fun or clip the wings on to Barbie doll's back to let fairy stories take off. Create a classic fairytale look or mix and match to tell your own story. This Barbie Dreamtopia Dress-Up Giftset Case includes 4 individually packaged dolls.